Jake Elliott kicks the game-winning field goal in the waning seconds of the fourth quarter. Mistakes, they made a few. More than a few, really. The Eagles made enough mistakes to crush the final, frail tendrils of postseason hope they were clinging to, on the next-to-last afternoon of the regular season. But not in the final two minutes. Not on the Eagles’11-play-plus-one-penalty drive from their 11-yard line to the Houston Texans’ 17, and not on the 35-yard final-play Jake Elliott field goal that gave them a 32-30 victory that meant life, heading into next Sunday’s finale at Washington. Here’s the drive rundown, starting with the kickoff after the Texans stunned Lincoln Financial Field with a touchdown and extra point that gave them a 30-29 lead with 2 minutes, 4 seconds left, in a game they’d trailed, 29-16, before Josh Adams’ fumble set them up near midfield with 5:21 remaining. It was the Eagles’ third turnover of the game against the AFC South leaders. · Kickoff returner Boston Scott, making his NFL debut, earlier had churned out a 35-yarder, but Scott got no blocking on this one and he only made it to the 11. He explained afterward that as he waited at the goal line, he couldn’t tell if the ball was going in the end zone or would hit short and bounce back toward the 5. “It was too close,” Scott said. So, 89 yards from the Texans’ end zone, the Eagles took over. · Foles missed Zach Ertz short middle and then threw way over Nelson Agholor, and suddenly it was third-and-10 from the 11 with 1:50 left. In the press box, there was talk of whether the Eagles might consider punting on fourth down and trying to get the ball back. 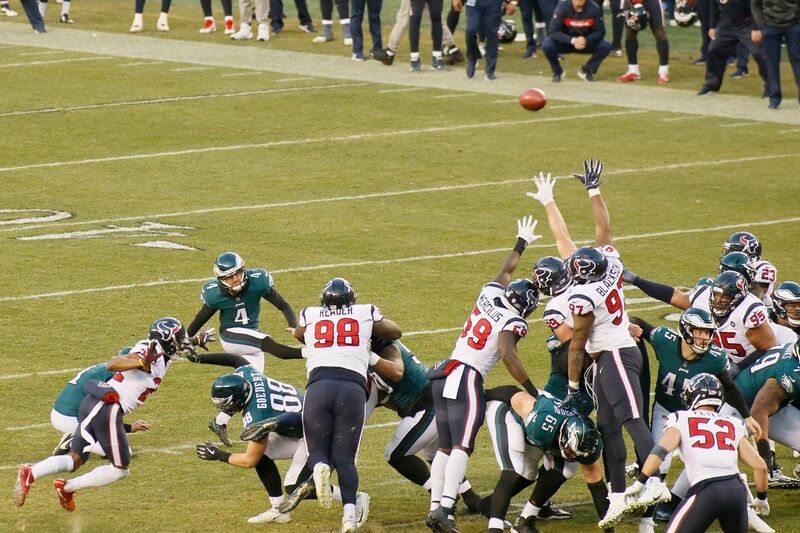 · Foles took a huge helmet shot in the ribs from Jadeveon Clowney as he unloaded over the middle. Alshon Jeffery outfought Johnathan Joseph and came down with the ball at the Eagles’ 30, but Foles stayed down, on his back, writhing, as a flag fluttered for roughing the passer. A minute and 38 seconds remained and as both teams watched Foles being attended to, Carson Wentz got center Jason Kelce to go over to Nate Sudfeld, so Sudfeld could take some snaps, before having to enter a game for the first time all season. “Carson did a good job of calling me over. I was kind of stuck in a daze over there,” said Kelce, who blamed himself for the hit. Clowney, a defensive end, came up the middle on a stunt. · Foles eventually got up and jogged to the sideline, but by rule, he had to sit out a snap, so on came Sudfeld for first-and-10 at the Eagles’ 45. He threw high and wide toward Jordan Matthews, the ball sailing out of bounds. · Foles then missed Agholor on a long bomb down the sideline. · Third-and-10 again. This time, Foles threw a high floater to Ertz, who twisted and turned under it like an outfielder chasing down a long fly. Ertz, who broke the NFL record for tight end receptions in a season Sunday, made the catch and got out of bounds at Houston’s 35. First down on the outer edge of field goal range, 1:23 remaining. · Incomplete pass to Sproles, but then, on second-and-10, a Sproles draw through the right side for 16 yards, the longest run of the game for either team. “It’s a play we don’t usually run to that front, it was a little different for us,” Wisniewski said. “I think that was a play they probably weren’t quite ready for in that situation … Sproles played great all day,” with nine carries for 32 yards, three catches for 76 and a first-drive touchdown, plus an 11-yard punt return. · One more Sproles run to the middle and it was time for Elliott. Three seconds remained. Thirty-five yards is extra-point distance, but both Elliott and Texans kicker Ka’imi Fairbairn had missed extra points toward that South end zone. “It was kind of a weird wind today … It wasn’t extremely windy, but for some reason, it was gusting weird in there,” Elliott said. He knew he’d hit it down the middle, didn’t stand and watch, Elliott said. He’s now 3-for-3 on last-play game-winners in his two-year NFL career. The Eagles have won four of five, losing only in overtime at Dallas. They lost too many games like this one earlier in the season. But even if this was their final appearance at the Linc until August, they sent their fans home with some Christmas cheer.